4x 16C450/550/Extended 550 Compatible UARTs, Supports RS232, RS485 & RS422 Modes, Bi-directional Speeds from 50 bps to 16Mbps/Port, Full Serial Modem Control, Supports Hardware, Software Flow Control. 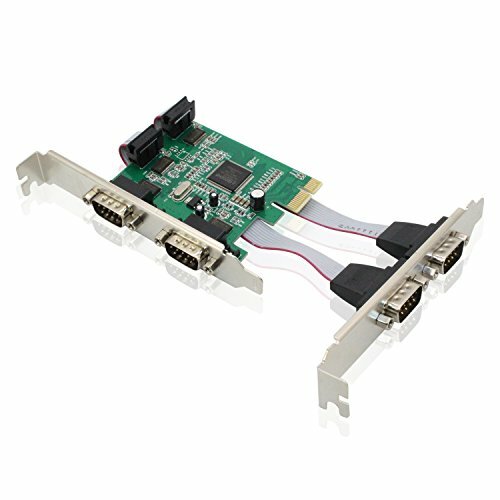 Tanbin 4-port DB-9 PCI-e serial port Card, 1 year quality warranty and friendly customer service. Fast and easy-to-reach Customer Service to solve your problems within 24 hours. If you have any questions about this product by Tanbin, contact us by completing and submitting the form below. If you are looking for a specif part number, please include it with your message. Cisco Catalyst 3850 48 Port Full Poe W/ 5 Ap License Ip Base . 48 Ports . Manageable . 48 X Poe+ . Stack Port . 1 X Expansion Slots . 10/100/1000Base. T . Rack. Mountable "Product Type: Routing/Switching Devices/Switches & Bridges"